This isn’t my one of my typical reads, but the mention of Scotland and hint of witches reached out and grabbed me. Heather is a girl who clearly has some issues – not only with cutting, but recurring nightmares involving twin sisters, Prudence and Primrose, both witches from the 1600s. Throughout the story, the POVs rotate between these three characters, although the sisters’ chapters are much shorter. 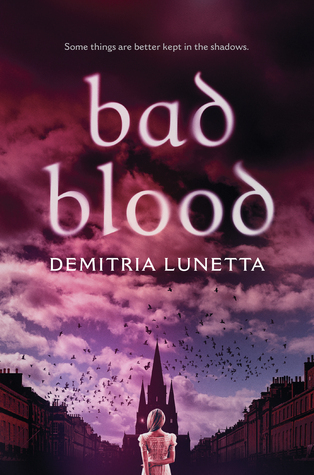 The historical flashbacks, witchcraft, and the author’s take on a ‘blood witch’ are my favorite parts of this novel, but these aspects aren’t really delved into until nearly halfway through the book. Heather and her supporting cast of friends have some fun scenes and Robby is sweetly charming, but I’m relieved the teen romance didn’t overshadow the plot. Once the pace really got rolling and the building suspense drew me in, the story wrapped up rather abruptly, leaving me a little frustrated. When I noticed so few pages remaining near the end, I even wondered if there might be a sequel. Admittedly I might have missed something, but I had trouble buying into the initial conflict that pitted the twin sisters against each other. Their later conflicts – absolutely, but it seemed a weak springboard. A wonderful setting, believable characters, and suspenseful mystery interwoven with witchcraft and magic – I just wish it would have been a little longer. Bad Blood is scheduled for publication March 14th, 2017. Thanks to the publisher and NetGalley for the digital ARC.